Our Junior Development Squad supports 14-18 years old by giving them opportunities to referee in a safe environment and provides the training and support they need to grow in confidence and experience. Each Junior Development Squad member is given a dedicated Coach and Mentor and will receive support from the Society’s group of advisors and assessors if they would like it. After you have a few games under your belt within the Society and want to go further, you will get a new squad kit! 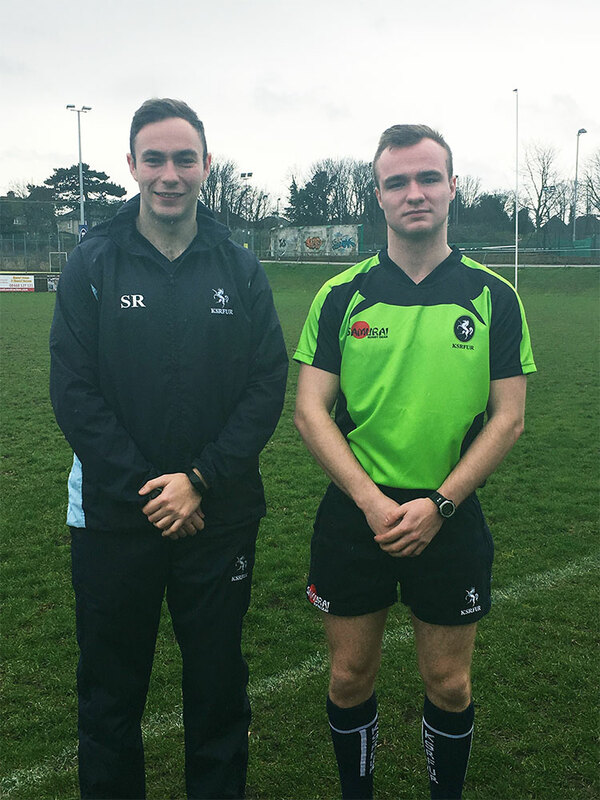 (modelled below by Steve Randall and Billy Huntley – two former Junior Squad members who are now refereeing for the South East Federation). Any young match official under the age of 18 is classed as a child and must be cared for in the correct manner. It is vital that we provide children in our Junior Development Squad with the best possible experiences and rugby opportunities. Everyone involved with working with children must operate within an accepted ethical framework and demonstrate exemplary behaviour to ensure the game makes a positive contribution to children’s development, safeguards them and promotes their welfare, as well as protecting all personnel from allegations of abuse or poor practice. This document sets out the key safeguarding principles as well as providing best practice guidance to all Society members.